Hands down, one of the best places to score beautiful wooden toys and other fun objects for children is at The Original Tree Swing. 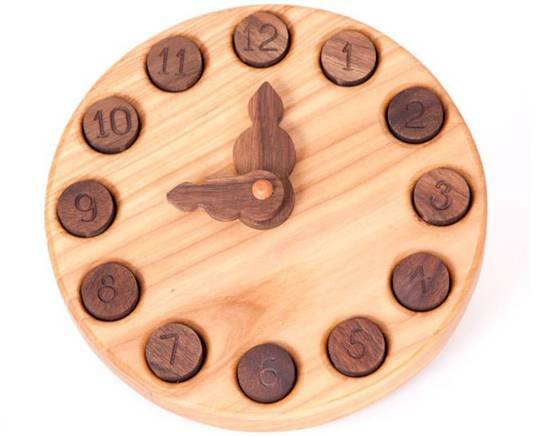 One of their newest kid creations, the Wooden Learning Clock, helps make learning about time, a little more fun. Made from reclaimed Ash & Walnut, and finished in natural beeswax, this clock is part puzzle, part teaching tool. Children can practice placing round number pegs into the correct holes, which in turns helps kids develop hand-eye coordination and memory skills as they learn to tell time. The clock hands can be moved as well. Do kids even see analog clocks anymore?